Misinformation about organic food production is everywhere. This Q and A will hopefully clear up some of the questions about what is and is not allowed in organic agriculture to control crop damaging pests. 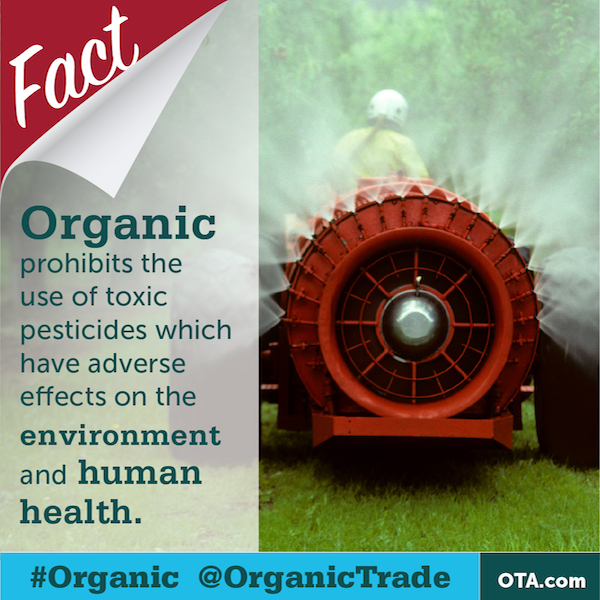 Q: Are pesticides allowed in organic farming? A: Natural or non-synthetic pesticides are allowed by the USDA National Organic Standards. These same standards prohibit MOST synthetic or man-made pesticides, for example, glyphosate (Roundup®). An example of a non-synthetic pesticide is a naturally occurring microscopic fungus used to infect and fight targeted insects. That is the short answer. As you know, everything is more complicated than it seems, so here is the long answer. The organic standards prohibit the use of most synthetic pesticides, however, under very special circumstances the National Organic Program allows the use of synthetic pesticides under highly controlled applications. The list of exceptions to the “no synthetics” rule is called the National List of Allowed and Prohibited Substances and is published by the USDA. Before organic farmers can use any of these substances, however, they must develop a pest and disease management plan describing how they will first prevent and manage pests without the use of National List inputs. The restricted toolbox can only be opened when mechanical, cultural, and biological controls are insufficient to control pests, weeds and disease. This is foundational to organic farming. The restricted toolbox used in organic production represents the best and least-toxic technology our food system has developed. Q: Does the National List ever change? A: Yes, non-organic inputs allowed in organic farming and handling under certain restrictions must be reviewed every five years. This provides an opportunity to remove them from the National List if they fail the criteria outlined in the Organic Foods Production Act (OFPA). Since 2008 there has been a great shift away from synthetics, only 5 have been added to the list and 45 have been removed, denied or further restricted. An example of a substance no longer allowed in organic products or denied permission to be added is non-organic hops in organic beer. Now that’s worth toasting! The National Organic Standards Board recently reviewed the list and recommendations have been submitted to the Secretary of Agriculture. Proposed changes can be found on the Federal Register website. Q: Do organic products ever test positive for pesticide residues? A: Low-levels of pesticides are occasionally found on organic products. When found, the residue levels on organic products are consistently lower than those on conventional products due to the preventive measures organic growers are required to take to protect their crops. Contamination can come from nearby conventional farms that use pesticides in the form of inadvertent spray drift, carryover of residues in the soil or contaminated irrigation water. Organic farmers are required to set up buffer zones to make sure that prohibited substances do not contaminate organic crops. Some organic farmers use hedgerows (a line of closely spaced shrubs and/or tree species) to form a barrier between their farm and a non-organic farm. Scientific studies have shown that organic products have lower pesticide residues than conventional products. A study published in the British Journal of Nutrition in 2014 found that the frequency of pesticide residues was four times higher in conventional crops than their organic counterparts. This was a meta-analysis based on 342 peer-reviewed publications covering nutritional quality and safety parameters in organic and conventional plant-based foods. Another study in the same year looked at whether an organic food diet reduces organophosphate exposure in adults. The researchers found that eating just 80% organic for a week can reduce pesticide metabolites in urine by nearly 90%. Q: Do ingredient suppliers test their ingredients for pesticides? A: We can only speak for our own quality standards. As part of our verification program, Global Organics routinely tests ingredients we get from our suppliers for pesticides and contamination at accredited third-party labs. In addition, all of our suppliers are organic certified which means they can be randomly chosen and tested for pesticide residues by their certifying agent. Any infractions require immediate corrective action. Q: Specific to sugar and chocolate, how are pests controlled on organically managed sugar cane fields and cocoa bean farms? A: In the answer to the first question it was noted that the 25 low toxicity synthetic pesticides that are allowed in organic farming can only be used when mechanical, cultural, and biological controls are insufficient to control pests, weeds and disease. Sugar cane farms that use conventional agricultural techniques have nearly 50 commonly used pesticides, herbicides and fungicides at their disposal. Our partner for organic sugar, the Native Green Cane Project uses beneficial insects and other natural predators to control infestations, no pesticides are used. Specifically, Native raises wasps in their entomology lab and releases them in the fields to fight the cane borer. Non-organic farms fight the borer by spraying with Furadan (a highly toxic carbofuran pesticide) or more recently by growing genetically modified sugar cane resistant to the borer. In the Dominican Republic, organic cocoa bean farmers use several biological controls including dogs, owls and snakes to combat woodpeckers and rats that damage the cocoa pods. It is important to note that organic farmers employ practices that build healthy soils, which nurture the plants and help decrease the incidence of plant disease. In between plantings, many organic farmers plant cover crops to replenish the soil with nutrients. These cover crops break pest-breeding cycles and also help maintain populations of beneficial insects (that eat harmful insects), reducing the need for pesticides.